A variety of infections and infestations of the gastrointestinal tract pose a diagnostic challenge for pathologists and gastroenterologists in the tropics. 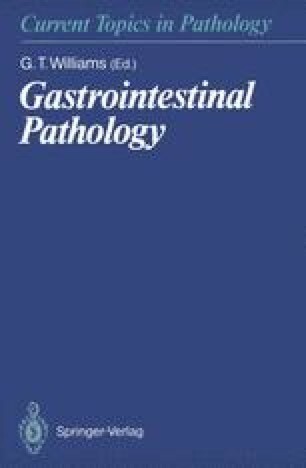 The interpretation of intestinal mucosal biopsies is complicated by the effect of the tropical, usually contaminated, environment and widespread malnutrition, which may influence gut mucosal morphology in even apparently healthy individuals. This chapter will concentrate on mucosal biopsy alterations that are widely prevalent in the healthy population in the small and large intestine and also on the specific bacterial and parasitic infections that can be diagnosed by gastrointestinal mucosal biopsy. It must be emphasised that the gastrointestinal pathologist working in the tropics should be fully familiar with the biopsy diagnosis of neoplastic conditions. This is particularly important since regional differences in the prevalence of malignancies are now becoming apparent (Ramakrishna et al. 1988).